I begin my Invertebrate Paleontology course by giving each student a common fossil to identify “by any means necessary”. This year I gave everyone a gray little brachiopod, one of which is shown above. They did pretty well. Kevin Silver (’13) got it down to the genus quickly. Turns out a Google image search on “common fossil” is very effective! 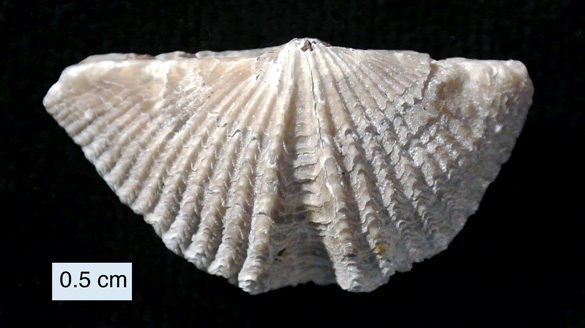 This is Mucrospirifer mucronatus (Conrad, 1841), a beautiful spiriferid brachiopod from the Silica Shale Formation (Middle Devonian) of Paulding County, northwestern Ohio. I collected it and many others at a quarry on a crisp October day with my friend and amateur paleontological colleague Brian Bade. 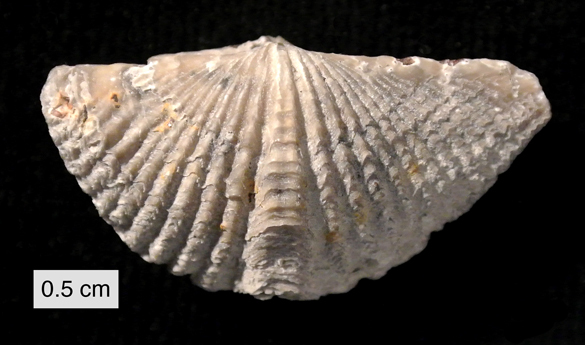 The image at the head of this page is a view of the dorsal valve exterior of Mucrospirifer mucronatus; the image immediately above is the ventral valve exterior. 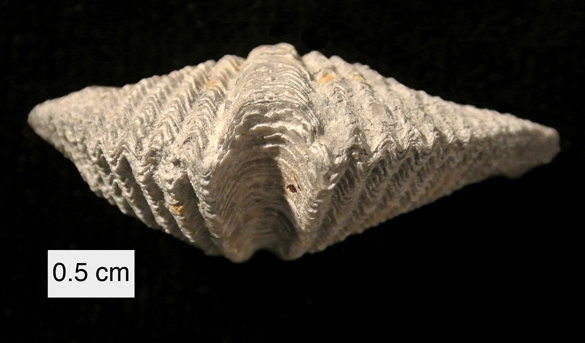 Spiriferid brachiopods like this are characterized by extended “wings” and a long hingeline. Inside was their defining feature: a spiral brachidium that held a delicate tentacular feeding device known as the lophophore. 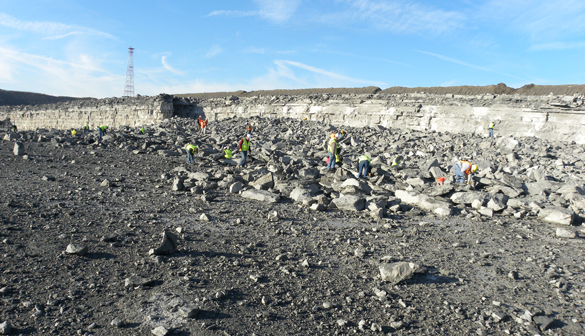 A view of the quarry that yielded our Fossil of the Week. Note the happy amateurs picking through blast piles of the Silica Shale Formation (Middle Devonian). 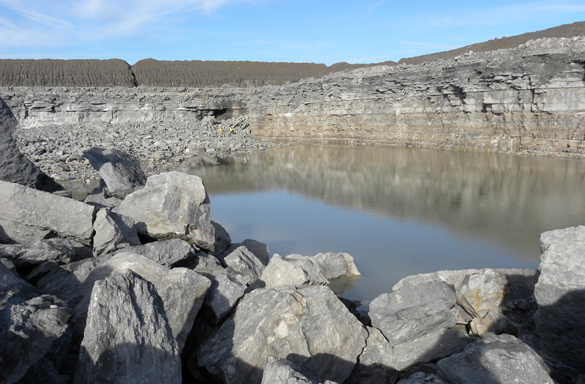 A pond in the quarry. It has an unexpected beauty, muddy as it is. 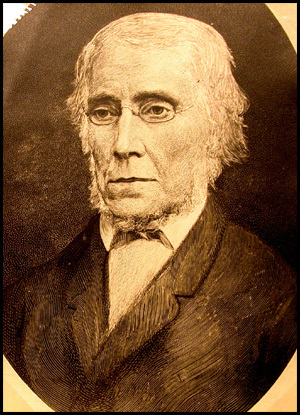 Timothy Abbott Conrad (1803-1877) described Mucrospirifer mucronatus in 1841. We met him before when discussing a siliquariid gastropod. He was a paleontologist in New York and New Jersey, and a paleontological consultant to the Smithsonian Institution. Tillman, J.R. 1964. Variation in species of Mucrospirifer from Middle Devonian rocks of Michigan, Ontario, and Ohio. Journal of Paleontology 38: 952-964. Dave, I’ve found a couple good specimens at a bend in a creek bed in Southeast Michigan among pebbles. Now/winter is a great time of year to look for them near/in creeks, as the water level is lower than normal most days and there aren’t any bugs.